Designed for CEOs, boards, and senior executives in HR, risk management, and emergency response management. 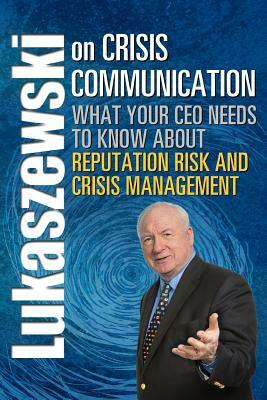 Jim Lukaszewski was listed in Corporate Legal Times as one of 28 Experts to Call When All Hell Breaks Loose and in PR Week as one of 22 crunch-time counselors who should be on the speed dial in a crisis. THE book on crisis communication, aggregating Jim's four decades of crisis communication wisdom in a format easy to commit to memory - ready to use when, and hopefully before, you face a crisis. Jim's common-sense, field-tested approach helps guide executives in how to behave, what to say and do, and how to lead their organizations through a crisis situation especially during those first critical minutes. His book fills the holes left by most crises texts: it explains how to manage victims, manage management, energize attorneys to cooperate and participate in the crises response process, and understand, and therefore reduce, the influence of the media (both traditional and social), activists, and antagonists. He focuses on a key element rarely dealt with in crisis management how NOT to create victims (who may publicly complain and sue), by managing people with compassion, fairness and honesty. In a crisis, Jim recommends 5 approaches: be positive; be compassionate; be transparent; apologize sincerely and with meaning; and settle quickly. These simple tenets are the most complex to execute because they run counter to many management cultures. He shares a bounty of practical tools, tips, charts, checklists, forms, and templates, e.g., since he advises you to make all your statements positive, Jim lists scores of positive words and phrases; categorizes numerous crises by risk; lists the causes of victimization; and describes media behavior/attitudes and details the social and digital media tactics to manage them. And, since a recent study shows that only 60% of the companies surveyed had a crisis management plan, Jim offers ammunition to motivate management to prepare for crises.